Scott Peterson arrives for his arraignment hearing Monday. CNN's David Mattingly reports on the agony of Laci Peterson's family -- and the anger of Scott's. Laci's mother agonizes over the deaths of her daughter and grandson. Scott Peterson is arraigned on murder charges in the deaths of his wife and unborn son. 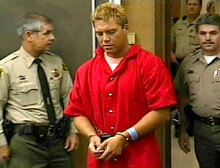 CNN's Rusty Dornin profiles Scott Peterson. MODESTO, California (CNN) -- Scott Peterson pleaded not guilty Monday to two counts of murder in the deaths of his wife, Laci, and his unborn son, charges that could bring the death penalty. When he was read the charges against him, Peterson, cleanshaven and wearing a prison orange jumpsuit, answered: "I am not guilty." Peterson, 30, is charged with killing, "with malice aforethought," his wife and their unborn son, who was due to be delivered February 10. Laci, 27, disappeared December 24. Police allege that the slayings occurred at the couple's home. The double homicide charge against Peterson means the district attorney could seek the death penalty. Stanislaus County District Attorney Jim Brazelton said his office has not decided what punishment to seek. Peterson's next court appearance will be May 6 for a bail hearing, with pretrial proceedings set to begin May 19. The criminal complaint against Peterson, which was released earlier Monday, listed the couple's house as the crime scene. Regarding the killing of the unborn child, the complaint states, under the heading Termination of Pregnancy: "During the commission of the murder of Laci Denise Peterson, the defendant with knowledge that [she] was pregnant did inflict injury on [her] resulting in the termination of her pregnancy." In a news conference a few hours after Peterson was arraigned, Brazelton said his office has a committee that will review all the evidence in the case -- some of which hasn't arrived yet -- before making a decision on the death penalty. He said he expects to reach a decision before the pretrial hearing. Judge Nancy Ashley appointed Tim Bazar as Peterson's attorney after the defendant said he wasn't in a position to hire a lawyer. Kirk McAllister, who had previously represented Peterson, refused to answer reporters who wanted to know whether the suspect could no longer afford his services. "That's between him and me," McAllister said, adding that he has told the public defender he will assist the case in any way he can. A source close to the investigation said detectives repeatedly returned to San Francisco Bay to conduct searches for the missing mother-to-be after they found specific tidal charts of the bay on Scott Peterson's computer. The source also said investigators found traces of concrete in the bottom of Peterson's 14-foot aluminum boat, which they believe might have come from some kind of concrete anchors. Outside the courthouse, hordes of reporters and television crews parted to make way for Peterson's mother as she made her way into the building. Inside the courtroom, Sharon Rocha, Laci's mother, was sitting by herself when Jackie Peterson walked over to her, hugged her, and said, "I'm sorry." Peterson's father, Lee, and his sister, Susan Caudillo, also were there. Dennis Rocha, Laci's father, and Ron Grantski, her stepfather, also attended the brief court proceeding, along with Amy and Brad Rocha, Laci's siblings. When Scott Peterson entered the courtroom, Sharon Rocha broke down in tears, said a CNN correspondent who was inside the courtroom. She later described her anguish during a news conference with other members of Laci's family. A memorial to Laci Peterson covers the front lawn of the house where police say she was killed. Peterson, housed in the Stanislaus County Jail in Modesto, is classified as a "maximum security" prisoner based on the charges against him, said Stanislaus County Sheriff's Department spokesman Kelly Huston. Peterson is separated from other inmates because they have threatened him, Huston added. "There are folks who have an unfavorable opinion of him, and therefore we want to protect him from having contact with those people," he said. On Friday, state authorities said DNA tests proved that two bodies that had washed ashore on San Francisco Bay were the missing Modesto woman and her unborn child. There will be additional searches for evidence in the case, Huston said, but he could not say where those searches would be conducted. The fetus was found April 13 along a trail at Point Isabel Regional Park. The next day, about one-and-a-quarter miles away, Laci Peterson's body was found washed up on rocks. Moving quickly -- and before DNA results confirmed the identities -- police arrested Peterson early Friday in San Diego, where his parents live. Investigators had a solid case against him even without the remains, Modesto Police Chief Roy Wasden told CNN.